Just picked a gallon of haricots verts (French for skinny green beans) and yanked up the plants as I went along. It was time. It’s about the fourth picking off of them, the plants are being attacked by several things –slugs, virus, BMSB’s and what looks like a tiny version of the Mexican bean beetle (maybe it’s tiny to stay in tune wi’ zee tiny leetle green beans!). Anyhoo, I’m sick of picking, have been freezing some, eating more, and the Ha’ogen melons and long-neck pumpkins want to overrun the space, so, as I said, it was time. 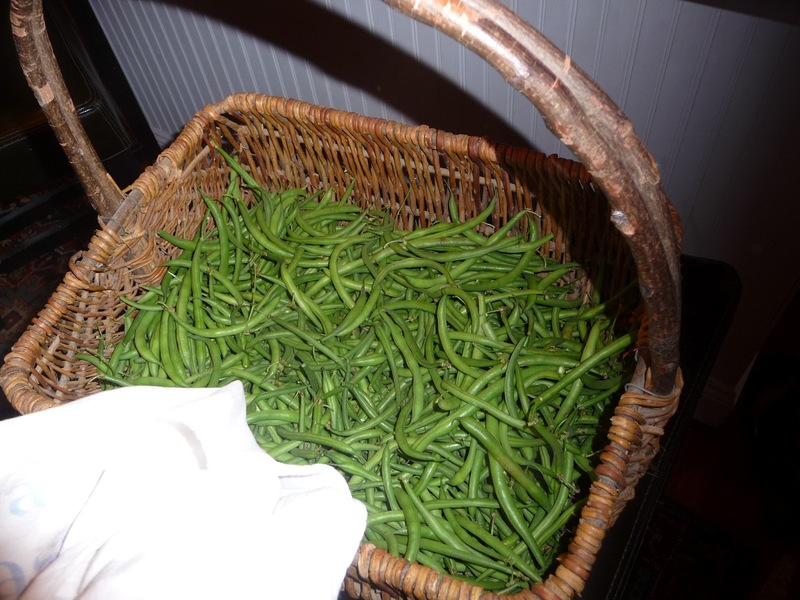 I love green beans and look forward to them fresh each summer. Beet and bean salad with mustard and balsamic dressing, chopped into vegetable soup, au gratin with shallots, onions and gruyere, green bean and tuna salad, as one of many vegetables in Ecuadorean fanesca soup with milk and peanut butter (there’s a great recipe in Rodale’s Garden-Fresh Cooking), or wrapped in a bit of tin foil with a piece of fish (haddock, whatever) with garlic, tomatoes, onions herbs and maybe a splash of white whine and shoved into the oven for about 25-35 minutes. 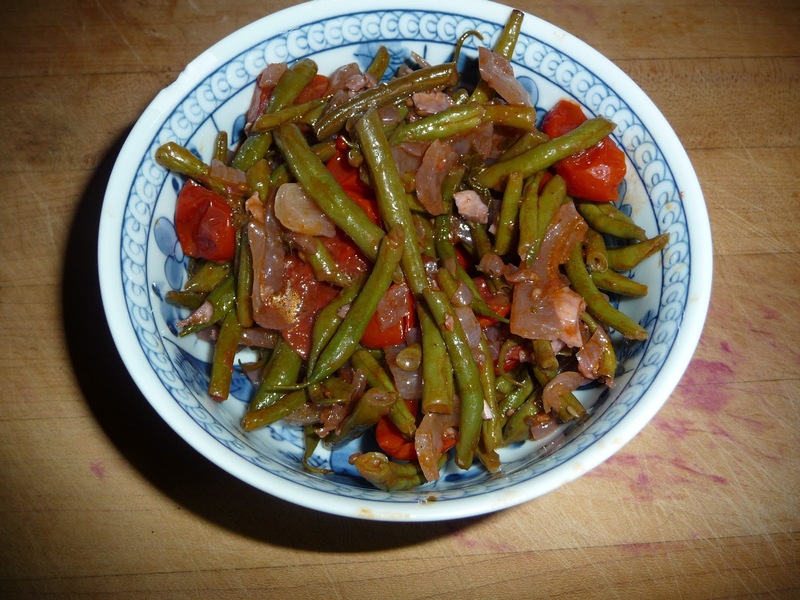 The quickest and easiest way to do green beans this time of year is to sautéed them quickly in olive oil with chopped onions, halved cherry tomatoes, fresh lime basil or oregano or parsley or a combination of all three, some fresh garlic, salt and pepper and a splash of red wine. It’s superb as a hot side dish with grilled chicken or fish and even better (at least I think so) the day after as a cold salad. I’ve still got another patch of haricots verts in another spot, but they’re looking pretty peaked and I’m hoping that this weekend I can muster enough energy to plant something for the fall — I’ve got packets of dinosaur kale, watermelon radish, and arugula. ← Roots, leaves, shoots in one dish! Nancy – to pick a gallon, how many plants do you have (or row-length/# of rows?) My green beans didn't fare so well this year, due to spider mites. My yellow wax beans seem to hold up a little better, and I like those better, anyway. I'm keeping my plants around a bit longer, because the cooler weather encourages better growth (while discouraging the mites). I had an early planting and a late planting this year, and the late planting might have a bit left. If I pick a handful every couple of days, that's enough for dinner. If you are grilling and looking for a simple way to cook haricots verts, place them on a sheet of heavy duty foil, sprinkle them with dark sesame oil and toasted seeds, fold the foil into a packet and place it on the grill for 15-20 minutes depending on packet size. Donna, I plan beans in a grid-seeds about 6 inches apart, which tends to cut down on weeding. I had about 40 plants. A small family of bunnies lived in there for a little while — or at least sheltered in there, since they'd run under the bean leaves whenever I get into the garden, but surprisingly, they didn't do much damage. (I guess there's so much else to chose from in the smorgasbord I provide them! Kent, thanks for the recipe. Sounds yummy. I need to try it with the few beans I have remaining! I'll also stick some of the cubanelle peppers on a an eggplant while I'm at it so I've got something for roasted eggplant, pepper and arugula salad. (with toasted walnuts, feta and balsamic/mustard dressing).